It is hard to write about Westwood without writing about myself, not that I am that interested in an ego boost, but facts are that Westwood Gallery is an outcropping of my own artistic vision and skills and a life full of different jobs, hobbies and interests. With that in mind, I suppose it all started somewhere in the distant past. I have spent most of my life in Western Oregon and most of that in the Willamette Valley. Though I don’t remember when it happened, seems I’ve always had an insatiable desire to create and I suppose for the most part that this is true for all artists and those dedicated to their work or play whatever that might be. I was fortunate in my growing up to have an understanding father who allowed me the use of his tools and garage, where, from the time I was in junior high, I built motor scooters from plumbing pipes and old gas motors, figured out how to put a lawn mower engine on a bicycle and many other such things, mostly mechanical, up to my last three years of high school. During that time, I built a Model “T” ford roadster, from the ground up, all from parts that I found around Oregon. Most of the parts for the car I worked for. This all began when I found this guy across town in Monmouth who had a huge barn full of old Model “T” and “A” fords, which he was in the process of restoring. He saw my interest and paid me a dollar an hour in car parts by working for him on his cars. Most of the work I did was in the form of scrubbing dirty engine blocks and sanding frames and stuff in preparation for painting. Anyway, I worked for the frame, front end, rear end and a few fenders and miscellaneous parts for my own “T“. I found the body for the car in a front lawn just north of the College right in Monmouth! The engine I found below the flood plain on the Yaquina River in a place called Chitwood located across one of the few covered bridges still left around the back roads of Oregon. It was there in Chitwood where I spent a couple of years growing up with my four siblings and mom and dad in an old cabin on the river while in the second and third grades. Turned out, years later while building my model “T” that my dad remembered the old engine and where it was under the briars behind an old shed. Dad and I took a drive there, found the engine still intact, covered in mud and looking quite on the other side of being brought back to life. I bought it for $10 from the old man who still lived there, brought it home and through a lot of persuasion, got it running with the original bearings, rings and all! I can’t tell you just how exciting it was the day I cranked it over and it started up! My Molel "T" in the midst of restoration, 1968 just outside my dad's old garage. Anyway, my life, like a lot of ours is a long story and I won’t go into all the details here or all the different jobs I have had or the businesses I have started. Guess the short story is that my hands have always been good working with my brain to figure things out that I have never even done or thought of doing before. As far as non-mechanical intuition and creativeness on the level of art, my younger years were nothing exceptional. I did a few charcoal drawings, got a blue ribbon in the county fair for one of them (seems there were lots of blue ribbons though) and did lots of little sketches in my notebooks while bored in high school classes. I guess one thing stands above all the rest; because of the places where we lived growing up, I ended up with an absolute love of the woods and nature. Us kids were fortunate to have a dad who took the time to take us fishing and hunting and camping and was himself a worker in the woods. I grew to love the country of Oregon from the trees to the mosses covering the shaded forest floor with a thick carpet of shades and textures of green. 1970 just after the 4th of July Monmouth/Independence parade on my dad's lawn on Broad St. showing off my first place ribbon in the antique car division. Nature inspires me, as does the place where I have lived for some 25 years now. There is for me a comfort in the serenity provided by nature that allows a freedom of thought that nothing else does quite the same. I have the time here to reflect and as a result of my surroundings, inspiration flows into my work. Anyway, about ten or so years ago shortly before selling a printing business I started and ran for some 18 years, I happened upon an old potters wheel in an old barn at a local yard sale. I bought it figuring it would be fun to do something different, creative, to get my mind off of all the years of meeting deadlines and the long hours printing. It wasn’t long after setting up the wheel and trying to use it that I realized this just was not going to work. I thought there must certainly be something major wrong with the wheel. Well, before deciding to give up on the idea of a new hobby, I decided to enroll in a beginner’s wheel throwing class at the Salem Art Association and after some very fine instruction began throwing pots like a crazed man. Again, long hours into the night. But the difference was, I enjoyed it in a way I have not enjoyed any other hobby, and I've had a lot of them through the years. So, here I am years and tons of clay later with pottery in art galleries up and down the Oregon coast and doing occasional art shows. But back on subject here…. I really longed to just stay home and be with my work in clay and woodwork (something I also have been doing for years). Westwood Gallery was born out of my desire to be at home with my wheel and kiln and materials so I could be creative at any moment instead of out trying to sell, loading and unloading, scheduling shows etc. and at the same time be in contact with the public (the true supporters and heroes of the arts). 2007 seeing just how high I can go! 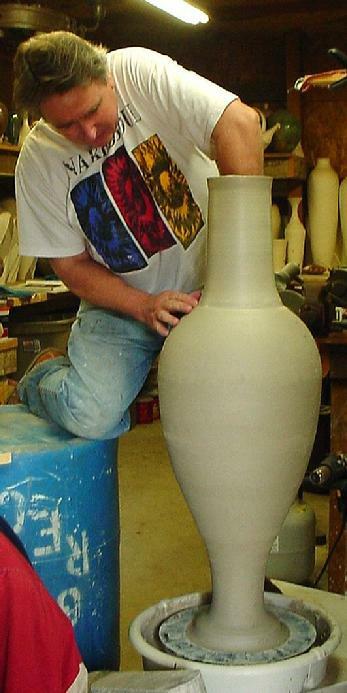 After bisque firing this pot ended up 42" tall. I could have kept on going but enough is enough!